Online Editor Alexina Estrada her farewell letter as she prepares for graduation. The 4th Annual Women of Courage panel was hosted by the Girls in Government, Leadership, and Service from Julia Morgan School for Girl’s on Tuesday, Feb. 6. Alexina Estrada is the current Online Editor for The Campanil. She was previously the Asst. Online Editor and has been on staff since Fall 2013. 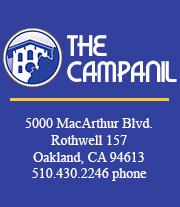 Contact her at estrada@thecampanil.com.